Oh, my darlings. Keeley & Dan’s wedding just over a week ago was like a family reunion for me. After photographing Keeley’s sister wedding (hey, Amber & Bryant!) two years ago at Broadturn Farm, seeing all of their family took me right back. That hug I got from the girls’ mom upon arriving at her home… sigh. What an awesome way to start an incredible day. I am a hugger, after all! Keeley & Dan reached out to me to photograph their own nuptials over a year in advance of their wedding date. Having worked with me already, it didn’t take long for them to officially crown me their wedding photographer. I love it when that happens! They were planning a backyard soirée at Keeley’s childhood home with their closest family and friends there to celebrate. In fact, the tent was actually set up where Keeley & Amber’s swing set was set up many years ago. I am sure that the weekend was a bit surreal to their parents as the lawn was taken over with lawn games, cocktail tables, an aisle, and a large white tent. With our communication on point, Keeley with her ladies and Dan with his guys were both able to get ready for the formal festivities in the house while not seeing each other before the long walk down the aisle. Once they were both ready and their guests were in place, it was time to get hitched and officially make them a Tinder success story. Yipee! 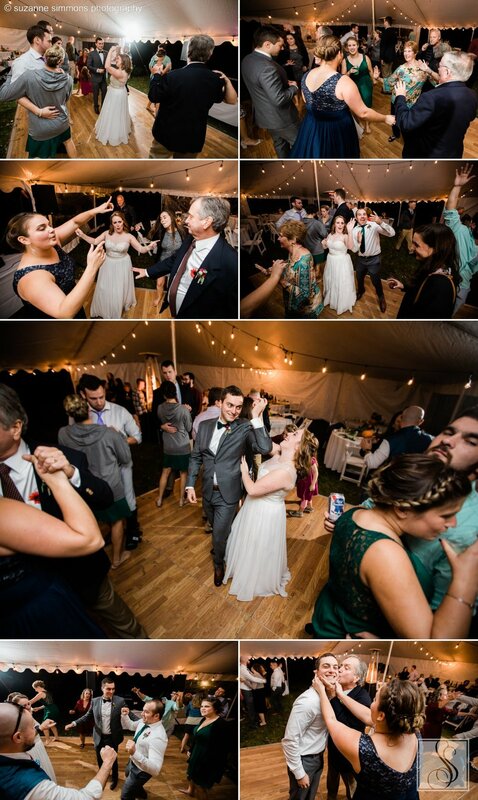 The rest of the day was filled with lots and lots of love and laughter as the newlyweds celebrated long into the night under a star filled sky. Their guests dined on Salvage BBQ before boosting up their energy for the dance floor with cupcakes from East End Cupcakes. And oh my did they all dance their socks off! I had such a blast capturing all of the antics on the dance floor, especially the floss battles that broke out between Keeley’s mom and the youngsters. Talk about an awesome way to start the next chapter of your life as husband and wife! Keeley & Dan, thank you so much for having me capture your incredible day. It was such a fun event and I had a great time getting to know you both better over the past year. Your full gallery is well underway, but here is a sneak peek of what you have to look forward to.